I always find it strange that traditional martial arts seem to dumb down the techniques for beginners. What I mean is if you go into any basic boxing or kickboxing gym, they will show you a stance, a guard, and the basic strikes. If you go to a traditional martial arts gym you will get taught line work kicking with your hands by your hips. The explanation being that you want to focus on the kick, not worry about the hands. You will get taught stances to (supposedly) help weigt transfer*. These are just a few examples, but it seems strange to me that there is such a difference in what gyms expect of students. I have a feeling that its because 'pragmatic' 'fighting' gyms expect people to work really really hard and become a great fighter. Alot if traditional martial artists just do it for fun. Anyway, I was ondering if anyone agreed with me about this difference? I'm going to put a big disclaimer at the beginning of this--I am NOT a historian and I am currently traveling, so I have limited access to reference materials, so this is based off of my memory (not that great) and is simply my own theory. More knowledgeable karateka and karate historians are on this board and can provide more accurate answers. I could very well be wrong, but I believe that the "dumbing down" process began when Itosu and his compatriots introduced karate into the public school system. 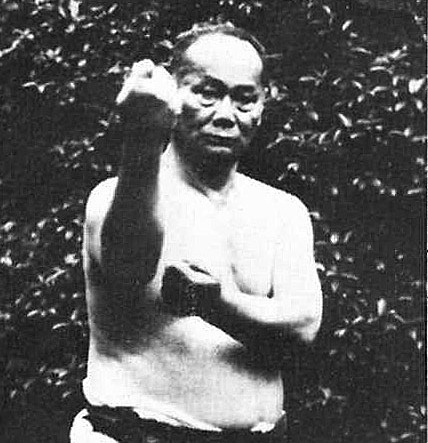 Karate was marketed to the Japanese government as a fitness regimen that also built physical, mental, and spiritual toughness (all things they wanted in their military conscripts). Since that was the way it was marketed, and because it was being taught to children that the instructors didn't necessarily know/trust, it was watered down to make it less combative. With it being taught that way, the Japanese wouldn't feel threatened by it and the students would still get all the physical, mental, and spiritual benefits of training, minus the practical combative applications. 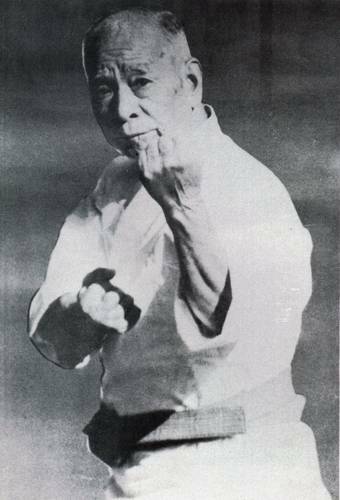 Funakoshi took this idea and built on it when he went to mainland Japan, and he made it so popular that, I believe, many people started teaching karate that way to fit in with that model because of how successful it had been in building the popularity of karate. I have a hard time believing that karateka that were known to be effective fighters (Motobu, Yabu, Chibana, etc.) would have learned their karate in this way, so I do believe that it was a new method in their time, and obviously not everyone learned that way. To be fair, karate wasn't developed for dueling, so it isn't as simple as having a fighting stance, a guard, and some basic striking techniques, but that doesn't mean it couldn't be used that way. 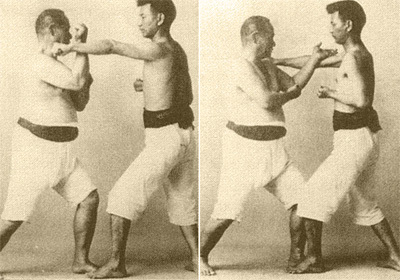 Many karateka had a preferred stance and preferred striking methods, which they most certainly would have taught to their students, and if you look at old Okinawan fighting methods, they include a guard position called me-oto-di (married hands, if I remember correctly, although I may have written it wrong) that is quite similar to the guard position of old school bareknuckle boxing. Do you think this style of teaching is valid today? It seems common, and im not sure its the best practice. And yes, the Japanese militarisation of karate had a significant impact on how it is presented today. Unfortunately I think these days it is detrimental. Fighters want to do MMA/Muay Thai etc while fitness people just join a gym. Karate has to change (again) if it is to last. I think Itosu had his reasons for introducing karate into the school system. At that time the Japanese were doing their best to assimilate Okinawa by discouraging (or even actively destroying) Okinawan culture. My guess is Itosu played the diplomacy game, said all the right words and managed to get karate in the schools system in order to preserve it, knowing that it would either continue in a new form or one day someone would unlock the key once more. Karate had to change, both in getting it adopted, and also in turning it into something distinctly Japanese. Karate is only as dumbed down as people want it to be. Alas most karateka will be happy sticking to the old format (and the art will die out due to lack of interest). Karate needs a new public image! On Japanisation of Karate. I attended a seminar with a master who said something interesting about his experience training with Okinawan instructors in the past: in contrast to the militaristic Japanese approach they would even, for example, smoke cigarettes in between practising moves. It's a difference in structure and approach rather than "dumbing down". Most eastern martial arts work off of a very structured/regimented program. It's part cultural, and the mindset of handling a lot of people at the same time. In that "fighting gym" you will see a couple of couches working with a handful of fighters. Yes, you are shown a "fighting stance" a basic guard and a couple of strikes and then left to work on your own. Other than just a brush up from the coach here and there, if you are not working up to a fight, you are going to be on your own. Pretty much, "Here's how you jab. Okay, good? Go do five rounds of rope and ten rounds of jabs on the bag." The martial arts instructor has to attend to the entire class, watching their technique and trying to bring them along at a certain pace. They have a wide variety of things to communicate and a lot of ground to cover in the education of the students. All of which expect to be given instruction every day. There is a method to the maddness that actually takes some time to see and understand. That hand on your hip is pulling back to do something. Those stances are about weight transfer or position. Try telling someone with no martial background to sink and settle their weight forward, or to drop it back and settle it into their hips. Stances are good physical short hand that save a lot of confusion. A sports fighting gym has a specific goal, very focused. It is to impart the skills of a competitive fighter. What type of skills depends on the competition. That competition implies a certain level of physical fitness is needed to partake in the competition. So, conditioning is part of what is done as part of regular training. If you are not there to train for that competion or to make use of the skill set in competition you are the anomoly, not the norm. Martial arts, such as karate, makes no such assumption on the reason for training. You can be there to learn to fight competitively, under many different sets of rules. You could be there to learn self defense skills. You could be there for fittness and stress relief. Or to take part in a cultural experience. Depending on the dojo, you will find students training for some or all of the above reasons. Which means that the instructor has to know his students and structure his teaching accordingly if he wants to keep the doors open. Few instructors? Bowlie, no offense meant, but how long have you been training? I may have gotten the wrong impression, but from other posts it doesn't seem like a great deal of time or with a large number of instrutors. Part of hearing about but not seeing in a lot of training has to do with being young in an art. Until you can handle a fixed stance, there is no point in trying to teach you to move fluidly between one and the next. Now, I've not worked with an instructor or traditional style martial artist of shodan or better who didn't teach and talk about stance work as transitory. I have a sneaking suspicion your sample size is causing as much of this view as anything else. Are there instructors out there who teach stances as fixed position? Yes, I'm sure there are. I haven't met them in my time training.